Editor: A local OB restaurant is in the news, but not for good reasons. The operator of OB Sushi was just convicted of seafood fraud for serving fake “lobster rolls” – along with 7 other operators of sushi restaurants across San Diego. It was a misdemeanor but the 8 sushi restaurants convicted, paid a combined total of $14,000 in fines and $5,000 plus for investigative costs. The misdemeanors could have been elevated to felonies if anyone had become sickened or had allergic reactions to the substitutions. Recently, my friend David and I decided we were hungry and ventured down Newport Avenue to grab a bite to eat. The first sushi restaurant we passed was crowded and noisy so we decided to walk a few stores down to the “OB Sushi Sushi” house. I noticed as we were greeted by a friendly person at the door, that the restaurant was in the process of changing hands but it was open, was clean, and we were hungry. The first thing I felt was the extreme cold of the environment. We were seated about three booths away from the door, and after sitting there for a few minutes either had to make the decision to leave or change seats. We changed seats to almost the rear of the restaurant, but even though not as cold as the original seat, it was still uncomfortable. But we were hungry and elected to stay. We were offered two separate menus – one listing many, many varieties of sushi; another listing appetizers, salads, soups, rice dishes, Yakisoba, dinner entrees and Bento and tempera combinations. Additionally on this menu were beers, wine, sake, soft drinks and desserts. Veggie tempera in foreground, beef teriyaki in back. David and I elected to each have one of the Bento combinations because it included Miso soup, salad, California roll and rice in addition to the entrée. 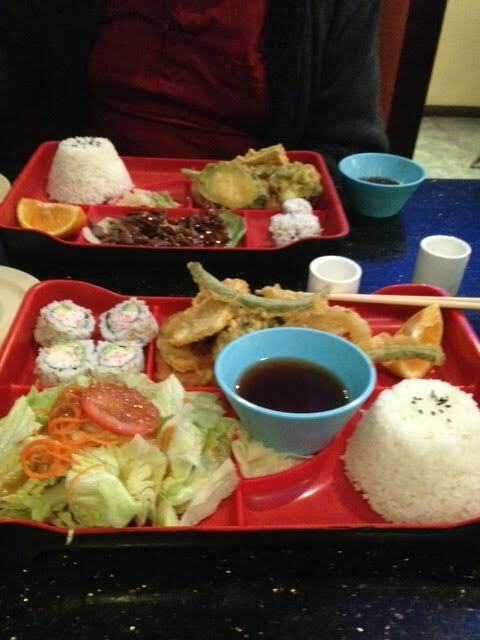 He ordered the beef teriyaki/tempera combination ($11.75) while I ordered the vegetable tempera at $9.95. I also ordered their house sake ($2.50). We were served the Miso soup almost immediately, thank goodness, because I was still very cold. The hot Sake came quickly also, and it was so hot I could not pour it into the saki cup. David offered to pour it for me, but he too found it very hot. (This is not a criticism – merely stating the fact.) We were served our salad while still eating our soup. The Miso was very tasty as was the salad. David was served his order first, and although it looked nice, the teriyaki was so cold that he had to send it back to be reheated. The rice was very good and it was hot and the tempura was also cooked well and tasty. I was served my tempera after David had started his meal, and all of the veggies were cooked well. I was somewhat puzzled about being served a side salad only to find another salad on the Bento plate. One would have been enough. In addition to the second salad, there was a mound of tasty rice, a dipping sauce for the tempera, and four pieces of California Roll. I did not realize that the cup of dipping sauce was on top of my wasabi and only when I asked for wasabi was it pointed out to me that the cup was on top of it. (I would have preferred that a plastic cup not be on top of what I was going to eat.) I ate one of the California roll’s but it seemed somewhat “off-tasting” to me and I did not have the others. Midway through the meal I accidentally dropped my chopstick, but after the initial order taking and the delivery of our food, no server came back to ask us if everything was okay, and if we needed anything else. It should be pointed out that there were many servers in the restaurant and it wasn’t until we were getting ready to leave that they became quite busy. Fortunately forks were also served and I used that rather than get up to get my own chopstick from another table nearby. The two plates were garnished with a wedge of Orange that had seen their better day. They were dry and old; better not to have had it at all than to serve it the way it was. There are three other Japanese restaurants in Ocean Beach; I have been to two others. The OB Sushi Sushi will have to improve greatly if they are going to compete with the others. Perhaps the new ownership will be able to make a difference. 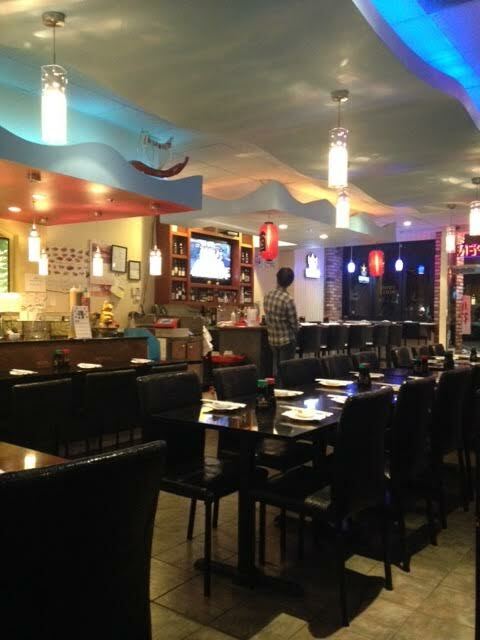 I actually like OB Sushi Sushi – not top-of-the-line, but decent for what it is. And I wouldn’t order anything too high-end from a cut-rate place. It’s still eons better than Sapporo, which I’m guessing used to get by due to its status as the only sushi bar on Newport – how they’re still in business these days baffles me. That said, Taika – the aforementioned “too busy” spot a few doors east at the restaurant that’s changed hands several times just in the decade or so I’ve lived nearby – has been getting my business lately. They’re similarly low-priced (for sushi), the staff seems just a touch more attentive, and not having the windows opening to Newport it’s comfortably cool (or warm, this time of year). What’s the fourth sushi spot in town that’s slipping my mind at the moment? Not the yogurt shop that has a pre-packaged sushi counter that my family always jokes about when we’re grabbing tasty frozen treats? Seems par for the course…if you want good service you have to go to somewhere like Pechanga Steakhouse and pay big money (I paid $240 for two) …..You just aren’t going to get good service in this day and age for a $30 meal. I never got my glass refilled when I went to a local sushi restaurant here in Escondido. The Joint on the corner of Newport and Cable. The last time I ordered sushi from the Joint I found an eyelash in my sushi. They gave me a new roll but it was still pretty gross. You are right, Dave. They were pricey. Not an eyelash !! Oh the horror !! Hope you didn’t suffer too much. Eyelash notwithstanding, The Joint has some excellent sushi and quite fresh. They just seem to have sushi guys who don’t know how to do a tight roll. But other than that, we’ve been frequenting them the most for our local sushi fix. Taika was started by Tim, who was one of the owners of OB Sushi, but he told me that his two biz partners there were always fighting (sometimes, literal fisticuffs!) and that he broke away and opened his own place. I enjoyed it when it first opened, but my last two visits there were disappointing in that the cuts of fish were skimpy, uneven and not as fresh. Sapporo in my opinion, has upped their game over the last couple of years which I’m sure was due to the competition from the others on Newport serving sushi. At least The Joint didn’t make the city attorney’s list of fake lobster sushi. I’m glad to see you writing again Ms Curry – and good on you to tell it like it is – gave them a “C” grade. Many publications have food reviews and they’re all very polite and basically try to sell the either current or future advertiser. Here the OB Rag and Judi go all gonzo and tell it like they and she see it. Admittedly, some times Judi you’re off base or somewhat too harsh on a new, budding, struggling eatery, or take shots at unimportant matters – BUT – you have fans , and I’m one, because you’re not afraid to voice your true opinion, and people appreciate that. They may disagree with you but at least you have an opinion, even if you destroy the possibility of that restaurant getting an ad in the OB Rag. Keep telling it like it is, Judi! I don’t know, Joe. The lobster fiasco had not happened when I wrote my review. But I do know that after trying one of the California roll’s on my plate I left the other three because it tasted off. I doubt very much that the owner did not know that he wasn’t serving lobster. Supposedly everything is made right there – in front of you. Lobster meat is different than other fish. But again, it wasn’t the lobster role, that neither David or I had; it was the other things on the menu. Tim from taika was running obsushi when they were fleecing their customers and selling fake lobster. He also calls fake krab “crab” on his menu now. Plus he was shut down by the health dept numerous times for rodent infestations at his pho restaurant before opening taika, in only a hand full of months. Neither of those restaurants care about the customer, nor the community. Didn’t see either of them participating in the restaurant walk. OB is better off without those restaurants. They get an epic FAIL! The city checked obsushi’s invoices and they never even ordered lobster. They are already changing hands again, but I would bet that it is to a family member, and nothing more than a straw purchase. Who would buy a failing sushi bar with 1 a couple of doors down, and 2 more within a block? Plus, I don’t think it was even listed anywhere for sale. This place and taika are also said to have written multiple FAKE bad reviews of their competition. They should be boycotted. Support local, not those owning shady businesses in ob to fleece customers! Do you know that for sure, Bob? I know they were cited for not using lobster and saying that they did, but the reviews? Wow…lots of conjecture or maybe just your opinions Bob? Tim had two other biz partners at OB Sushi. He wasn’t running it by himself. Look at my earlier post…his other two partners were fighting…in front of customers. His final straw in leaving was watching them come to blows in front of customers! Where Taika is now, it was Ciao Bella (I think?). They also were cited many times for rat infestation and not sure if that contributed to their closing. It’s possible that there is a rodent problem there and at other stores along that block. It was certainly there before Tim opened Taika. To put Taika into this category of not caring about the customer or the community is an extremely broad statement that you have nothing to back it up with. Have you ever eaten at Taika? The few times I did when it first opened, Tim could not be more caring about how I felt about his product as a customer and even gave me a discount the next time I came in because he had reco’d a certain roll that I couldn’t afford at the time and that was so cool. Not participating in the restau walk…..do you have any idea how many restaus here do NOT participate in the walk?? Many do not. I don’t think that has any bearing on whether they care about the community or not. A lot of them can’t afford to participate. Statements like, “I would bet that it is to a family member” and “I don’t think it was even listed” also, “This place and taika are also said to have written multiple FAKE bad reviews of their competition.” are all very inflammatory comments and pure guessing on your part. Where’s your proof to back up any of those statements?? Then you call for a boycott? How is any of this , “Support local” in your eyes? The only “epic fail” here is YOUR lack of community support for a place that is struggling, as most restaurants do. My suggestion is, if you’re going to make accusatory statements on a public web site, at least have the facts to back it up. Mercy, i am stating facts and opinion, just as you are. I do ask that you please do not take this discussion to a person level against me. This is not a personal attack on you, yet a discussiin about someone who continues to pull the wool over the eyes of many in our community. Im curious. Do you know why, although tim says he owns taika, he is not listed as owner on legal documents. You can query ca abc for this info. So yes, it is a fact. Seems like a straw owner to me (yes, this part is my opinion). Tim ran obsushi every day while they were lieing and fleecing their customers by selling fake lobster. He was closed down multiple times by the health dept within a very short time frame for rodent infestations. Just because tim says something does not make it a fact. You have excuses for all of his issues. You simply can’t blame previous owners for his rodent infestation. A good pest control company will handle that. And most of the buildings on newport are joined together, so they ALL have the potential for this problem. And the health dept saw them during the day time, that’s really bad. Also, did you talk to his old partners to get their side, or are you just believing what tim said? There are 2 sides to every story. And FYI, I support local. I have lived here for over 20 years. This is why his actions really piss me off. Here here, Judi, yo tambien. Thanks Molly. I know that the “editorial we” will never agree on everything, but I have gone to many a restaurant with a good review and felt like I had been had. All I can say is my review is as I see it at that particular time. I always try to take people with me so that there is a consensus of opinion. Maybe you would like to join me sometime in a new place?